We have lost a great artist. A great mind. A humanitarian. A dreamer. A lover. A hero. A true legend. Take a moment to reflect on everything David Bowie has given the world. Now ask yourself, what did David Bowie have, which you lack. The answer is courage. 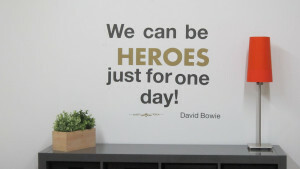 Be a hero today, in honor of David Bowie. Anyone can create something unique. We all have the same creative potential sleeping inside. Take it out, once. The best way to honor his death, is to honor the way he lived. This entry was posted in Inspire Me, News, Photos and tagged David Bowie, news on January 11, 2016 by Admin1976.